Uae4arm is a new Amiga emulator with JIT, which enable faster CPU emulation by compiling piece of code just in time instead of emulating each byte code independently. 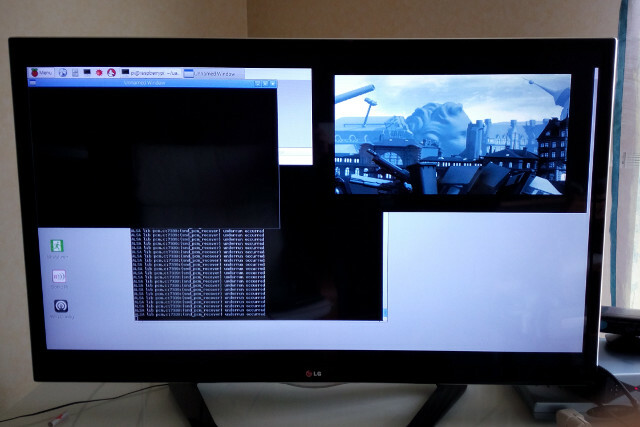 It has been tuned for Raspberry Pi, especially on display side by using Dispmanx for smooth framerate. tvservice -e "CEA 31 HDMI"
Merge of latest TomB version for Pandora. Rework of dispmanX management (huge picasso improvement). Add 4/3 shrink for 16/9 screen. Alt key can now be used to switch between mouse and 2nd joystick. Merge latest TomB improvements (Zorro3 memory, picasso...). Use dispmanX for fast scaling and double buffering. Enable hat usage on joystick. Add Sony 6axis joystick workaround. Last edited by Chips on Sat Oct 13, 2018 5:49 pm, edited 12 times in total. verry cool!! thanks a lot for this new beauty! Nice work Chips, this is brilliant. It's the best Amiga emulation I've tried on the rpi so far, by a long way. First Sanurai finally works properly. IK+ sound works correctly too. Alien Breed 3D II is incredibly smooth, probably 060 speed at least. Controls are great in this release too, plus the scaling looks spot on. There is quite some code which aren't activated, like Zorro memory upgrade and picasso video card. I just succeed to get 64MB of Zorro memory, and tried the best AGA demo: Starstruck. It loads and works ... but quite slow even with JIT moreover Fastest clock lead to few frame displayed... so i was stuck with 25Mhz. Don't expect to see theses options soon, it's too buggy at the moment... except if another dev look at them. Last edited by Chips on Fri May 15, 2015 11:09 am, edited 1 time in total. Of course I've taken a look at the sources before asking, and the Makefile seems to be using neon assembler optimizations, so maybe Rpi1 is left out in the cold this time? Hi, great work. I'm not sure that the preset joypad buttons work properly. I selected the preset 'A =fire, B=fire2' but it keeps using X to fire. (I'm using a iBuffalo SNES controller). Are there any other keyboard keys that we need to know ? I noticed CTRL enters the GUI. I also had to create a directory called 'conf' otherwise the configs wont save. Keep up the good work. Chips thank you for porting this so quickly. somehow it segfaults at start for me. does it run on console without using x? The only things that could prevent to make it works on rpi1 is the JIT, I have no idea for which Arm core the code is generated... except this nothing would be a blocking point. rSl wrote: somehow it segfaults at start for me. TomB posted a new version ! I can't seem to get the preset joypad controls to change buttons. Whatever preset I choose it always uses the same button. I also tried setting Custom joypad buttons, I set my joypad buttons for Fire 1 and Fire 2 but then only the D-Pad works. I also can't get savestates to work. I think I might have to create a directory for them to save (like I had to to save the configurations) but I don't know what the directory should be called. Any chance you could take a look at these two problems please ? Thanks for your hard work. Chips wrote: You're on Rpi2 ? I tested both X and console and basic A500 games were working. yep on rpi2 using composite out, running wheezy fully apt & rpi-update'ed. after startup even before opening the gui. using retropie's sdl did run ok.
back to gui the fonts are missing. but it looks more smooth on cracktro scrollers! X and console work fine for me with the first build Chips linked. New V0.2 with latest TomB improvement available. I didn't try picasso though... Zorro3 memory enable starstruck to execute and framerate is ok. I'm not sure if my posts are showing up. I'm using UAE4Arm 0.2 on RetroPie 3. I can't seem to get the preset joypad controls to change buttons. Whatever preset I choose it always uses the same button. I also tried setting Custom joypad buttons, I set my joypad buttons for Fire 1 and Fire 2 but then only the D-Pad works. It used to work fine on your version of UAE4All. Any chance someone could check please ? P.S. Is there only a drive light for DF0: ? I wasn't sure if external drives were working because they dont show a drive light. It seems that these problems are the same as when UAE4All was first ported to the Pi (from the Pandora). I got save states to work by creating the required directory but it doesn't display a screenshot in the savestate screen (like it should). windale wrote: I'm not sure if my posts are showing up. I'm using UAE4Arm 0.2 on RetroPie 3. For the drive light, go to "miscellaneous", and check "status line"
I get a drive light for DF0: but are there supposed to be drive lights for the external drives as well (DF1: to DF3:, when enabled) ? Also, i'm new to this JIT thing. What CPU are you supposed to use it with ? I tried some WHDLoad Demos with 68020, fastest possible and JIT. All I got was crackling sound. It went away when I turned JIT Off. I suppose that you're not supposed to use it with games either ? Thanks. lovely handcrafted fixes & features! even my missing fonts issue is gone now, awesome! borders in the gui top and below. change the mcpu/mtune values to cortex-a7. your native dispmanx integration vs. dispmanx-sdl! windale wrote: I get a drive light for DF0: but are there supposed to be drive lights for the external drives as well (DF1: to DF3:, when enabled) ? If I remember well, using "status line" give me track ID and activity of both DF0: and DF1:... they are the two at the most bottom right. The other at left are HDD and CPU % activity (CPU% activity seems not correct on Rpi). DF2 and DF3 activity looks like to be not displayed. windale wrote: Also, i'm new to this JIT thing. What CPU are you supposed to use it with ? I tried some WHDLoad Demos with 68020, fastest possible and JIT. All I got was crackling sound. It went away when I turned JIT Off. I suppose that you're not supposed to use it with games either ? Thanks. Don't use fastest if demos/games are meant to be used on plain 1200 or 500. Use correct clock value instead. Fatest seems jerky anyway... it should be mainly used for performances measurement purpose. JIT should be activated always. Gui is based on SDL, and I don't change resolution for SDL (nothing change compared with uae4all) since SDL resolution change is broken on Rpi. Even on hdmi I get black border due to this constraint. Im putting together a retropie build script for this, but its exiting after compile. I Think its due to the fact the makefile doesnt exit cleanly. Strange error since the uae4arm binary compiles(and works) fine. Can someone cast their eyes over the makefile and see whats up? thanks! Edit - nevermind this was not the issue- my bad spelling was! This might not be on a high priority list, but is there any chance we see a better joystick integration someday? As long as joystick port mapping is automatic and therefore quite random, there is no way to play seriously - esp. multiplayer games with more than one controller. A further step would be to implement parallel port joysticks for four player games like dynablaster and great courts 2. I did check several emulators the last days, but only the raspberry ones seem broken. This would be my desired solution. I reached a level of desperation, I even started unraveling the source code of a lot of emulators during the last days. But my c++ skills got quite rusty. Maybe I am wrong with this request here and this should be requested a level higher in the uae hierarchy? But where/who is this? how do you get the binaryfile that small? i guess it's somehow compressed, right? I unplugged my wireless keyboard-mouse combination and used a single wired keyboard. I also unplugged my xbox-gamepad and left only the two GPIO-Joysticks. Because it is not possible to use these joysticks inside Retropie (not enough buttons), I quit to console and started UAE4ALL2 manually. And guess what? I could start Great Courts II and play a two player game with both joysticks. No matter what, port 0 is mapped hard to /dev/input/js0 and port 1 is mapped to /dev/input/js1. In tests before, js0 was my xbox pad and there was some strange behaviour when a mouse was conntected, which got mapped to port 0 too somehow, but also blocked port 1. So my GPIO joysticks got ignored, because they were not the first two devices. In yesterdays test one GPIO-Joystick was js0, the other was js1 and no other devices were conntected. Et voilà... working! But this is a terrible workaround. The solution is to change the joystick init function and map it by the configuration gui. All that has to be done there, is to list every connected device (getting number of devices by SDL_NumJoysticks () and list names by SDL_JoystickName(joystick)). Then let the user choose which devices to use for each port. My test was done using chips UAE4ALL2 version 5. I had some problems with UAE4ARM (no button click), which needs some further testing. Hi, here are some things that I hope will get fixed in future (that used to work on UAE4All2) but i'm not sure who to ask, Chips, TomB, or Lubomyr ? 1) Joypad presets and custom joypad buttons, these don't seem to do anything or don't work properly. It keeps using the same button for fire on my joypad. 2) Savestate screenshots. It would be good if we could see if we saved a state for the game and where it was saved visually. 3) It no longer saves the scrolled position in the file requester. This was very useful when having to change disks because it was positioned in the list at the last disk that was inserted. Now it just starts from the top of the list all the time and you have to scroll down to find the next disk. I still don't understand JIT. Sometimes in a demo for example, it runs great but in the next part of the demo it just crackles the sound. I don't see any difference. Fastest possible CPU seems to make a difference but JIT doesn't. rSl wrote: how do you get the binaryfile that small? Adding a panel to select joystick should not be too much effort, it just needs some time. I'm still improving the SDL surface management on Rpi code. I'm now using specific surface set to the emulation size instead of using the one from screen which isn't set to emulation size on raspiberry pi (due to broken resolution change). It should enable proper screenshot for save state, proper blit from SDL (so switching from mouse to joystick using alt key can be displayed), and even improve picasso since it was still quite broken on Rpi (more than pandora case).